When I take pictures I find I need to mentally shift down a few gears, to slow my pace from that of daily life, so that I can properly get to know my surroundings. Sometimes I try to rush this process, to take a picture in a short amount of time no matter how inspired I feel, because there is money to be earned and each photography trip costs me time and petrol. Often, however, I find inspiration doesn’t come on demand or the weather isn’t conducive to photography. One or more return visits may be necessary to get a shot I’m really pleased with. While some of my pictures are the result of a single outing, others have involved months of effort in planning and making multiple trips to a location. Coming home from a trip empty handed can be really disheartening, particularly when it might be some time before I can try again. However I don’t think any trip is wasted. The making of one image in particular taught me a lot about the creative process because it took over four years before I achieved something I was really pleased with. 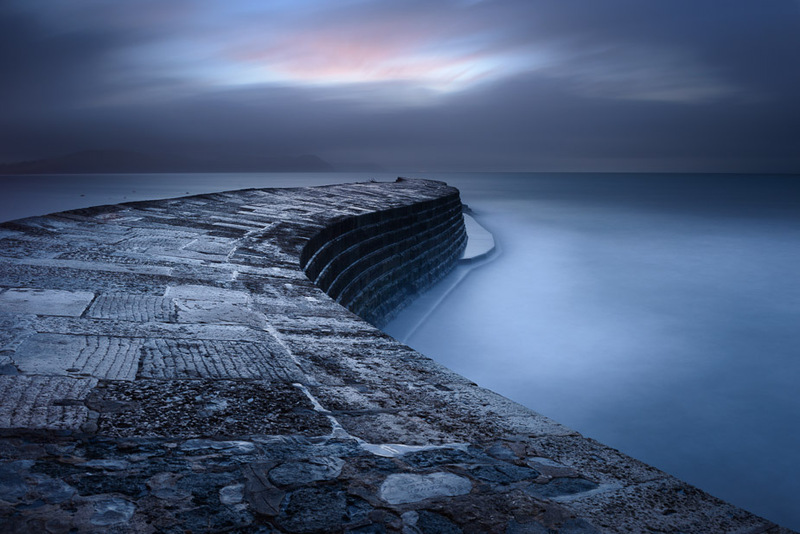 The image in question is of the Cobb, a historic sea defence in the coastal town of Lyme Regis, Dorset. I wanted to photograph it under a dramatic, colourful sky with swirling waves in the sea below. It’s a photograph that’s been repeated hundreds of times in various guises by artists of all persuasions but I felt a pull to create my own version. 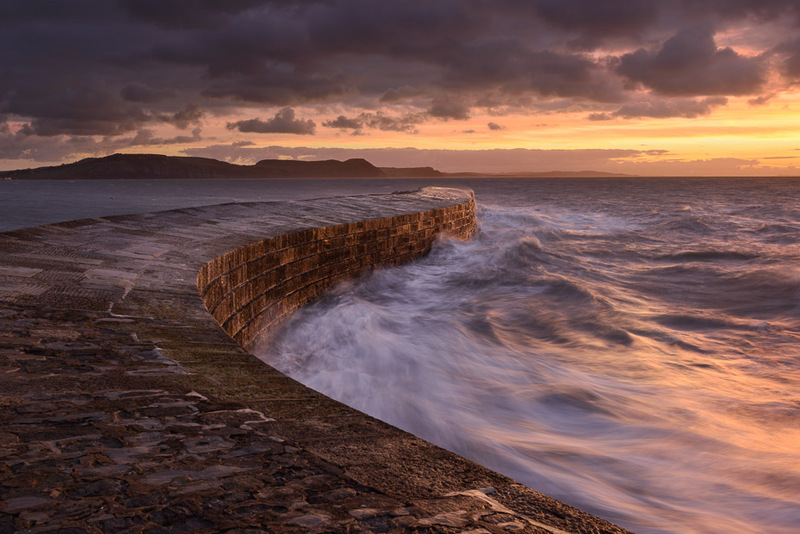 I’d been to Lyme Regis a fair number of times when I was growing up, so I had memories of the area, and I think the Cobb itself is one of the most interesting coastal features in Britain. This was taken on a scouting visit in October 2010. It was a Sunday morning when plenty of people were walking on the Cobb so I used a Lee Big Stopper filter to achieve a very long exposure and blur out anything that was moving. The picture I imagined myself taking had a moody sky with dramatic light. I wanted it to have texture and a sense of movement. 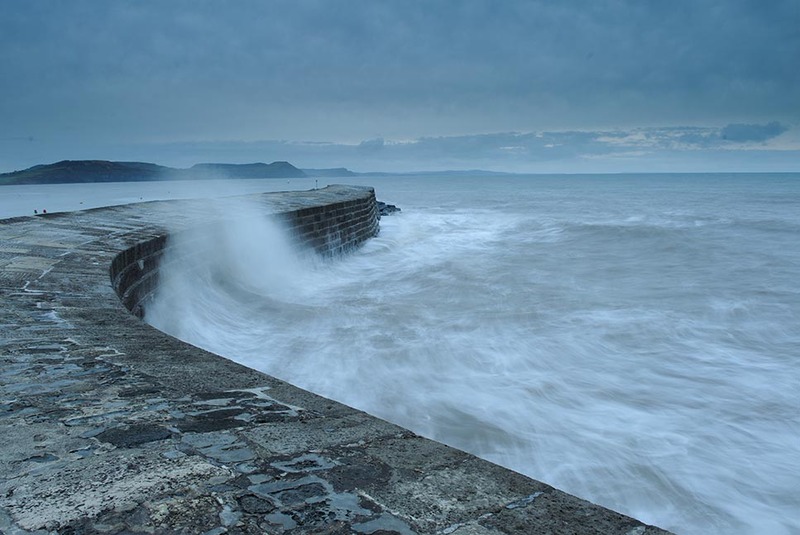 To capture this I knew that I’d need to visit during high tide so that the waves would lap high up against the Cobb. To get the colour I wanted in the sky I’d need to visit at dawn in autumn, winter or spring due to the direction in which the sun rises at those times of year. What’s more, there would need to be sufficient cloud over Dorset but not over the sea to create the intense sky I hoped for. These elements rarely coincide, especially at convenient times, so it took a long time to reach my goal. In October 2010 I made my first visit there with my camera. Several more trips would follow over the years. The forecast for my second visit looked hopeful but in reality the sky was blanketed with cloud. It was fun watching waves crashing over the wall. One visitor got soaked as they walked along it. I reflected on the repetitive process of visiting the same place time after time, seeking the right conditions for my picture. I became familiar with the drive from my home in Somerset to Dorset, learning the bends of the roads and the names of towns and villages I passed through. In Lyme Regis I found a free parking spot that was near the seafront and I timed how long it took to walk to the Cobb from my car so that I could save a few minutes here or there. 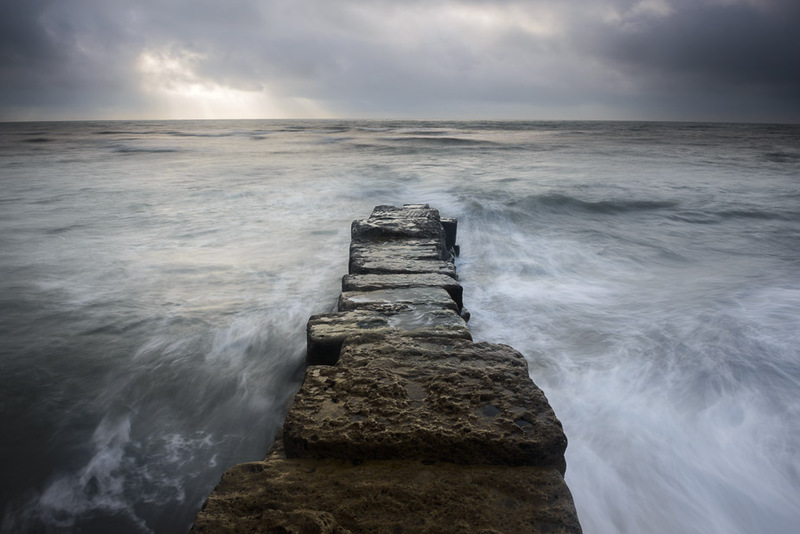 During some visits the sea was rough and foreboding so I stood back and watched it from a distance, not wanting to get soaked by the huge waves brought on by an approaching storm. On other occasions the weather was against me and a wall of cloud on the horizon blocked any pre-dawn light. I did a lot of watching but not a lot of photographing. I got to know the Cobb and its surroundings very well too. I noticed smaller details that went unnoticed at first. I found bricks with writing on them and the rusty remains of nails that were traces of bygone times. I also became familiar with sights and sounds such as the comings and goings of fishing boats, the lap of the waves and the smell of the sea. Some of these elements I captured in my final picture but others were background noise. I found that as they became more familiar I was less distracted by them. That made it easier to focus on the details of the picture – on what I was seeing through the viewfinder – because I was comfortable with my surroundings. I slotted into the rhythm of the place. From my third visit, taken over an hour before dawn. Way too much cloud meant that this patch of clear sky was the only colourful part of the scene. It was quite dark so I had to take it with a two second exposure but I quite like the effect. Each visit I took at least one picture even if the weather or light wasn’t right. It was useful to review these pictures later as I could see which compositions worked best. They were sketches of a work in progress. I might change compositions only slightly but each time I was refining my approach. After several failed trips I grew weary and disillusioned with the pursuit of the image I’d originally thought of. I wondered whether it was worth pursuing any longer. I stopped visiting Lyme Regis as I couldn’t bear another early start followed by a long drive only to return home with nothing to show for my effort. I pursued other ideas and that helped give me fresh perspective. 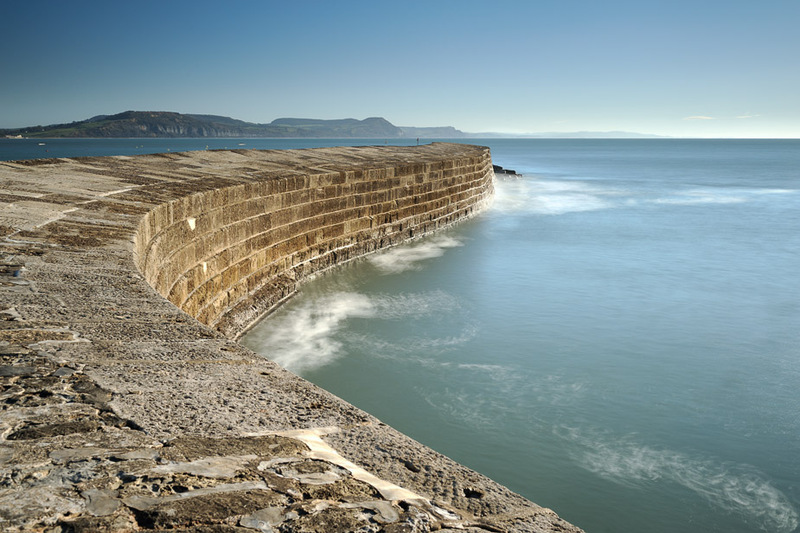 Later in the morning of my third visit I photographed some of the other features of Lyme Regis such as this sea wall. The light was good with plenty of drama. In time the memory of past trips faded and I felt the urge to try again. By now the routine of travelling to Lyme Regis was easy. It felt familiar, like a commute to a workplace, because I had taken every step of the journey several times. I began to appreciate that my previous attempts weren’t in vain but that they were helping me better understand my subject, in the same way that a portrait photographer builds rapport with a person they’re going to photograph. One January morning in 2015 I finally managed to capture the picture of the Cobb I’d originally hoped for. The dawn sky was beautiful, with a bright orange glow emerging from beneath dark clouds. As soon as I pulled into the car park at the seafront I had a good feeling as I could see dark clouds with an amber glow emerging from beneath. The sea was slopping around, occasionally throwing a wave over the Cobb. As I set about taking pictures I felt a sense of calm. I knew exactly where I wanted to position my camera and I felt prepared. My previous attempts had been rehearsals and this was the live performance. I got there in the end on one morning in January 2015. I felt like I’d earned this. Purchase this picture as a print. I haven’t returned to Lyme Regis with my camera since taking this picture. I suppose I have scratched that itch and I don’t feel the need to go back just yet. There are, however, lots of places I’ve visited just once or twice that are still a work in progress.